Graffiti and street art is as old as mankind and a natural form of communication and art in cities. Since early mankind people paint images on walls like in the carves of Lascaux or write personal or other notes like the found texts in Pompeii. The graffiti and street art as we know it started in the late 60's in New York and Philadelphia, where young people started to write their names on walls and trains. This culture exploded into an amazing variety of styles and artistic forms during the last years and has taken a lot of influence onto modern youth cultures and also entered the design and artworld with their direct and artistic expression of images. This book tries to show the historical roots of this artform to the modern styles and trends. During the last years the whole culture feels a fresh new wind with artists using different techniques to the old prefered medium: the spraycan and other works appear as stickers, posters, stencils, brush painted images or even sculptures. The modern graffiti / street art movement is expressing their own personal thoughts and mind to a wider publicity while using the street as their gallery and giving an alternative image to see next to the flood of commercial advertising, the modern street artist is trying to communicate with the city and its inhabitans and also using the archtitecture and the social surroundings as a background to their paintings. I tried to give a wider view into this culture with presenting the most interesting and influential artists from the past and now. Each artist or crew is presented on their own pages with a text summary and a lot of quotes by the artists themselfes. This shows the unique and fascinating range of the modern styles of this culture with their differnces from country to country. After nearly 3 years of work, research and travels nearly around the whole world and with the help of uncountable contacts, I have now finished this great project - for you you take a look inside! 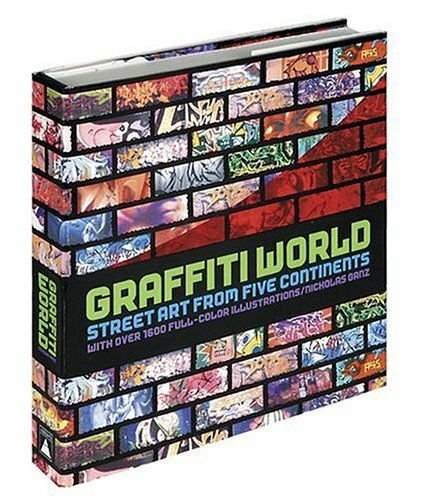 On 376 are presented more than 180 international artists in more than 2000 images - a comprehensive documentary of this worldwide phenomenom of graffiti and street art activists. Exhibition with photographs and artworks by Nicholas Keinom Ganz. Presentation of the book with book signings in context with the Kulturfenster serial exhibitions. Exhibition to the book launch of the Dutch edition of the book De Wereld van Graffiti with international included book artists and book singing. -> More infos soon!! Book launch event with exhibition of the book artists Other (Canada), Adam Neate (UK), Blek Le Rat (France) & Paris (UK). Official book launch party with exhibition of artworks, prints and photographs by the book artists SheOne (UK), Nick Walker (UK), Inkie (UK), Kid Acne (UK), Zaki Dee (UK), Keinom (Germany) & Stormie (Australia). Drinks (beer & rum) and posters, prints, books, thirts and painted hats will be available at the night. Continued accusations that graffiti is 'crime not art' have recently prompted Tony Blair, along with 121 British MPs, to endorse the Keep Britain Tidy campaign for zero tolerance to street art. However, graffiti has evolved greatly since anonymous spray-can art began appearing on city walls and subways in New York and Philadelphia in the late 1960s, earning its exponents the respect of the art world and guaranteeing its long-lasting influence on art, graphic design, music and style around the world. But is graffiti and street art still an unruly art form communicating with the passer-by in the urban landscape in a direct way, using ancient traditions and forms? Speakers include: Nicholas Ganz aka Keinom from Germany, author of Graffiti World; graffiti artists Stormie from Australia, Other from Canada, and Paris and Nylon from England. Supported by the Europe premiere of a clip of forthcoming movie Who is Bozo Texino? by Bill Daniels, a documentary of the monikers and work painted by hobos and rail workers over the last 20 years, featuring work by Bozo Texino and Barry McGee aka Twist; and Just to Get a Rep, a film about the love-hate relationship between graffiti and hip-hop, directed by Peter Gerard, which premiered at this year's Edinburgh film festival. Book launch event in Bristols Fopp Record store with book signing and painted window by local artists. Tickets for this event can be won at http://www.fopp.co.uk. To get on my friends list, please contact me. Exhibtion and book singing for the Dutch edition of the book show features some included local and international book artists. -> More infos soon !! Book signing at the big book market in Amsterdam. i've got first letter from Nicholas almost three years ago, in november 2001. 3 years of work and the result got to be great. seems like kind of streetart encyclopedy. and participation of Tristan makes glad too. the other thing that makes me look forward for publication. is that this book published by T&H will be really distributed worldwide. not only in USA and western Europe. American one is much better from my point of view. he promised free book to all that helped him to gather some information it would be nice ... i think it will be so damn expencive ... or maybe i'm wrong ?